David Lansing is going to kick-back and enjoy the sunsets during the holidays. His writing will resume January 2. 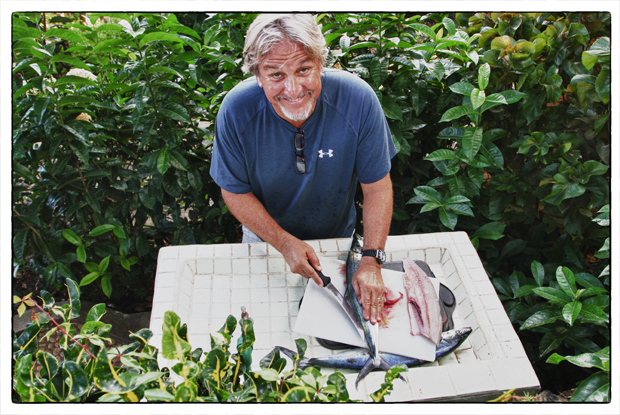 When we got back from fishing I took a long hot shower and packed my bag and said good-bye to the Fletchers. There was a certain buzz in all the little towns that I passed through. More people on the street, more food stalls and little markets. People were getting ready for the holidays. When I got to my house, I stopped for a minute before putting the key in and unlocking the door. I had no idea what to expect. Maybe there would be an inch of water in my house or maybe the roof would be caved in. Who knew? But everything was fine. In fact, it was more than fine. It was wonderful. While I’d been gone everything had been repaired. The air-conditioner hummed. The floors were dry and spotless. Ice dropped into my glass from the in-door ice maker. It was as if Santa had come overnight and given me everything I’d asked for. I decided to walk along the beach into town and have dinner. It’s about a thirty minute walk from my house to Bucerias. The beach was surprisingly empty. 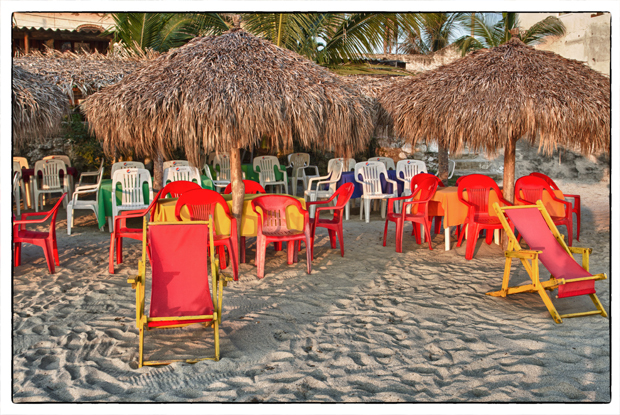 All the chairs and tables were set up in front of the many beachside restaurants but there were no customers. It was as if everyone was just waiting for the church bell to ring in the plaza announcing the beginning of the Christmas celebrations, and then everyone would come out of their homes and wander the plaza, make toasts at the bars, order huge platters of food at the restaurants, sing and get drunk and have fun. But not just yet. 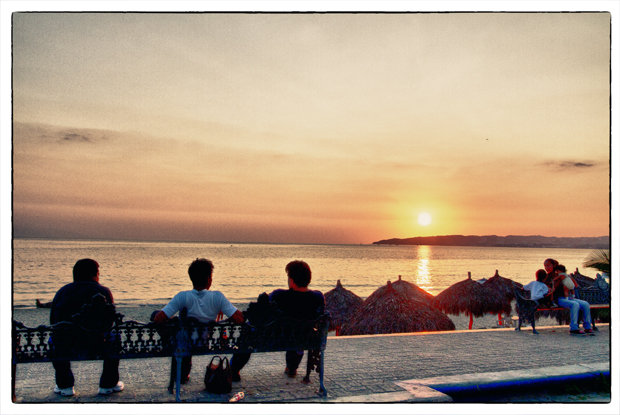 For at least a few more hours, I would have Bucerias all to myself. So I walked to Adriano’s and I sat at a small table looking out over the beach and I ordered a margarita and when the waiter came back to take my order, I told him to give me a little more time. Certainly, he said. Tonight there is no hurry. And he smiled and looked around the mostly deserted dining room. I finished my drink and then I ordered the ceviche, which was very good, and a glass of white wine. And when I finished that, I ordered a lobster because it was almost Christmas and I was dining by myself and I felt like something special. I also ordered a bottle of Spanish wine and I ate the lobster slowly, savoring every bite, and drank my wine and when my dinner was over I sat at the table and listened to the music coming from the plaza and the sound of the waves beating the shore and thought about nothing. Nothing at all. 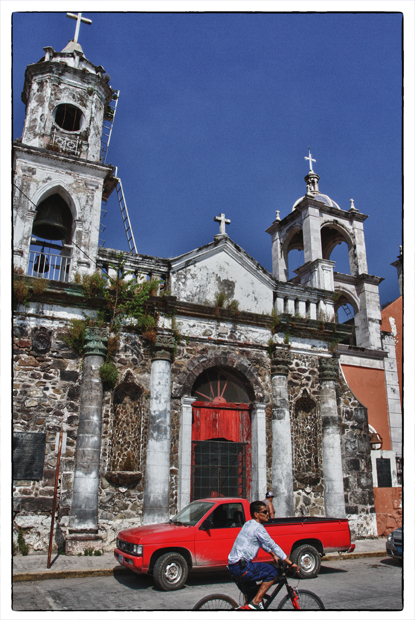 The old church at San Blas. Photo by David Lansing. After the jungle cruise at La Tovara we went in to San Blas itself which is just one of those typical little Mexican towns with dusty cobblestone streets and an ancient church that seems to list precariously and a congenial plaza ringed by little restaurants selling mostly mariscos and pescado. Chris and Malin were on a bit of a mission. They were looking for the wife of a naturalist named Armando who had died quite suddenly of a heart attack a couple of years ago. The Fletchers had become quite fond of Armando who they’d hired to guide them through La Tovara on one of their early visits and had also taken them out fishing. In addition to his wife, Armando left behind several children, one of whom was just beginning university, and so they had set up a fund to help send him to school. Now they were hoping to find his wife to see how the family was doing. We walked down the street past the Mercado and the sidewalk fish market to where they thought Armando’s wife lived but no one was there. Then we walked around the town a bit ending up at one of the restaurants on the plaza where we ordered cold beers and a half dozen shrimp tacos to share. The tacos were very good. They were made from the dried shrimp you find being sold by street vendors in little plastic bags. Just as we were leaving, Armando’s wife showed up. She’d heard the Fletchers had stopped by her house and came to the plaza looking for them. She was an attractive woman, still very youthful, and seemed happy to see the Fletchers again. They talked about their families and hugged each other and then it was time for us to head back to Custodio. When they got in the car, I asked Chris how she was doing. What he didn’t say is that the fund he and Malin set up not only pays the expenses for Armando’s son to go to school but also provides a monthly stipend for his wife to live on. It’s an extraordinary contribution on their part. And no doubt greatly appreciated by Armando’s family. The jaguar at La Tovara. Photo by David Lansing. When you get back to the end of La Tovara to where the natural spring comes out of the ground there is a cocodrilo nursery where they raise crocodiles to be released into the river. There is also a fenced in pond with very clear water where we saw hundreds of tilapia and catfish as well as about a dozen or so turtles either swimming about or sunning on logs. There was also a jaguar. 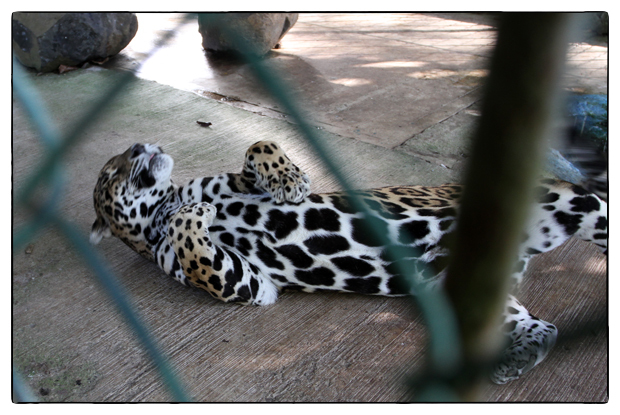 Our guide said that the jaguar had been found in a pen at a little village high up in the hills and that it could not be released because it had been declawed. What a magnificent looking animal. It looked to me to be a juvenile and in good health although you couldn’t help but feel sorry for his modest circumstances—a small enclosure no more than ten by ten with a concrete floor and just a couple of boulders for ambience. Still, the jaguar looked to be in very good shape and was quite active when we were there, rolling around on his back like a dog with an itch and showing off his beautiful smooth belly. Such a rare animal. Such a beautiful animal. Too beautiful to be locked up alone in such a small cage.